Design lejlighed på privat have i hjertet af Batignolles. Fremragende studio 32 m2 i en traditionel bygning i Paris med adgang til en privat have. Delvis adskillelse mellem stue og rasteplads. Et livligt kvarter: mange gode restauranter, vinbarer, gallerier, økologisk marked, købmandsforretninger åbent om aftenen, koncertsale, biografer, teatre. Flere parker og den dejlige Batignolles Have med sine gamle træer. Tæt på Montmartre, Champs Elysees, Opera og stormagasinerne for en stor parisisk shopping. Tre metro stationer i 5 minutter, flere busser i nærheden til at komme nogen steder i Paris. My 19 year old daughter and I took a quick trip to Paris for her Spring Break. This was the perfect place for us to stay. The bed was very comfortable and my daughter slept on the pull out and was amazed at how comfortable it was for being a pull out. When we arrived, Catherine and John showed us everything we needed to know and had stocked the fridge with some items for the morning, which was so thoughtful. I love that there is a nespresso machine and there were nespresso capsules supplied as well as teas, honey, etc. There is also a traditional coffee maker. There is a Brita type water filter pitcher that saves having to buy bottled water (just pack your own refillable water bottles). The place was very clean and quiet. We only made simple breakfasts, but had everything we needed. There is a dishwasher and washing machine, and the soaps are provided. The bathroom shower had great pressure and we never ran out of hot water. The bathroom is also very well stocked if you do not want to bring your own soaps, shampoos, q-tips, etc. We really liked the sky-light type windows that open with a remote, but have blinds to keep the morning light out. There is heating in the apartment that kept it a comfortable temperature as it was in the 50's and 60's while we were there. We didn't spend much time in the apartment as we were out from early morning to late evening, but I was so glad to come home to such a comfortable place. We ran into Catherine and John a few times and they were always very helpful and informative. The apartment is very safe with three different doors to go through before reaching the inner courtyard where it is located. There are three Metro stops about 10 minutes away (although the La Fourche station was under construction and closed) and restaurants and bakeries close by to walk to. 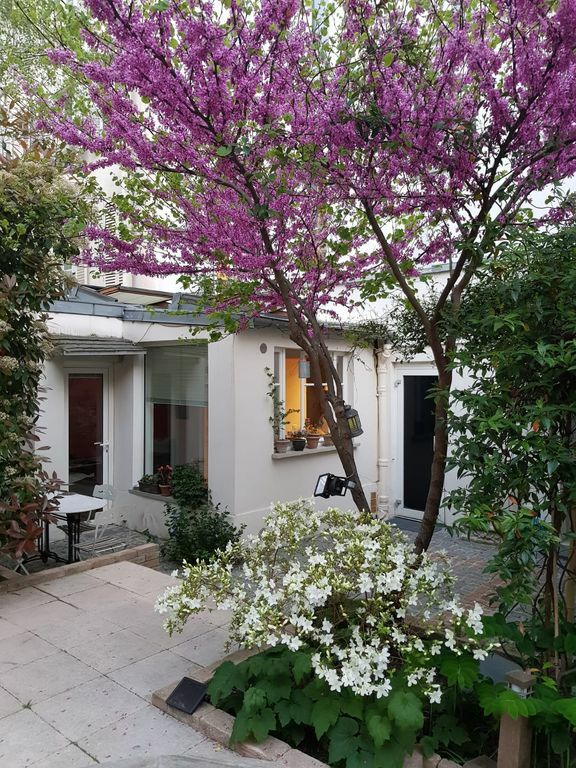 It is fun to step out onto the residential street and start your day in Paris. We would stay out late at night and felt perfectly safe walking home at night. Catherine was extremely helpful with our plans on getting to the airport the day we left, and sincerely concerned that we would not miss our plane. She was truly an angel in helping us out with that. I am hoping to go back again and I will stay there if it's available. I would like to go back because Paris is such a wonderful city, but I would also like to go back and see Catherine and John again---such nice people. Enchantée par mon séjour. L'appartement est très bien équipé, propre, très confortable. Bien qu'il soit situé dans un quartier assez animé, il est très calme car dans une cour intérieure privée et la petite terrasse est bien agréable, il me tarde d'y revenir aux beaux jours. Catherine est une hôtesse charmante et attentionnée. Merci Martine pour cette appréciation 5 *. Ça été un plaisir de vous recevoir. Je vous ai aussi bien sûr mis 5 *. My husband and I had a delightful 5 days in Paris at this apartment. Montmarte is a wonderful base with numerous great cafes and shops and it is near a subway station for access to all the city. We loved the private patio to sit with a glass of wine after a busy day of sight seeing. The apartment is quite clean, the skylights make much brighter than some big city places, and it is very safe with locked outer and inner hall doors. A cute, clean and very safe place to stay! We had a great experience at our VRBO. The owner, Catherine, left us maps, books, and information to help make our week in Paris just perfect! We hope to be back! Merci Beaucoup Catherine! Peaceful, comfortable and well equipped apartment in a fun and safe neighborhood. The apartment was as nice as others have said, and Catherine was helpful and kind. We were two women in our 70’s and found the walking to the shops and restaurants very manageable. We absoluely enjoyed coming back to the peace and quiet of the lovely garden, and the comfort of the rooms. If am fortunate enough to come back to Paris, would definitely try to stay here again. We stayed for two weeks and made it our home away from home in Paris. It was nice to have an outdoor space to sit. The neighborhood was friendly and we found all that we needed to enjoy ourselves when we were not out sightseeing. Catherine and her husband were great hosts.